Marie, I purchased your Stuffy Pals Set a while back and can't tell you how many compliments I have recieved on them. 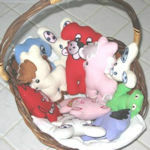 I make them in Minky fabric and attach them to baby gifts and everyone raves about them. I also purchased the Farmland Applique set and used them on baby burp cloths. Let me tell you you how cute they are! My next project will be with the Pineapple Lace. I have already stitched it out and it is a beauuuutiful design! Your talent amazes me Marie. And your customer service goes above and beyond and certainly makes me a happy and returning custmomer. I also love your forum. It is a lovely place to visit and everyone there is so encouraging and helpful. Thanks for everything you do Marie.